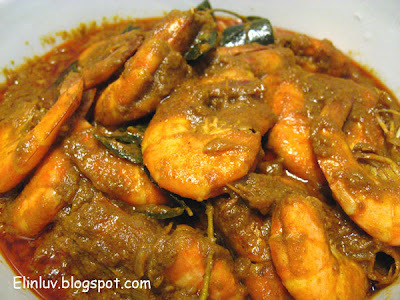 Recently , I learned to cook this dry curry shrimps from a friend. She gave pointers which were valuable in cooking this curry dish. :) It was one fantastic dish and I managed to cook it to the right consistency and the taste was extremely delicious… the combination of the curry paste with added curry leaves, lemongrass , pounded shallots and last but not least the most important ingredient, the coconut milk, has given the curry a uniqueness only the tongue can describe. A favourite dish of Daddy and Piggies….but I won’t allow Daddy to take more than 5 shrimps at a time…I counted the shrimp heads on his plate :p :)))) I have to control his diet or he can finish the whole dish at one go and he is pestering me to cook this dish again! Heat up oil in a wok, add in all the ingredients above except the coconut milk and the shrimps. Continue to stir fry the ingredients under small flame till the oil separates and surfaces. Slowly add in the coconut milk and keep stirring and cook till the fragrance of the curry paste has been released. Add in the shrimps and cook till the gravy has thickened and the shrimps is coated with the curry paste. Dish up and serve hot with rice. 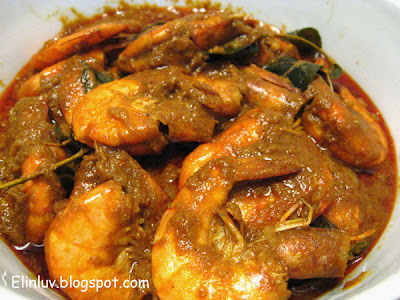 Note: This dry curry shrimps goes well with yellow glutinous rice too. U make me drooling! I'm a prawn lover, curry prawn, BBQ prawn, stir fried prawn....I love all of them. There's something wrong with my previous comment. As I was saying, I am sure Daddy found it difficult to limit the shrimps intake .. That looks extremely delicious! @ Little Inbox: Haha, I know you love seafood! I would love to try out this dish but we can't get the curry paste from here. Do you know what spices is in the curry paste? So inviting recipe to follow, the ingredients are great.. so delicious! This looks delicious! Shrimps are one of my favorites. I just joined your blog, i'm your newest follower.